Jon Honeysett MBE outlined the need for co-ordinating North Staffordshire’s canal projects at a recent Clough Hall Residents Association meeting. The following day twenty-four members of the Convention boarded two Heritage narrow-boats, Nb. LINDSAY and unpowered ‘butty’ KEPPEL (a working-pair owned by the Etruria Boat Group, and operated by Mr. Andrew Watts and his crew) at Etruria for the two-mile voyage up the Trent & Mersey Canal, to the recently refurbished Middleport Pottery. Aboard LINDSAY were Cllr. Jack Brereton from Stoke-on-Trent City Council, and SCC Officer, Alan Smith, with copies of two Reports published in 2014, documenting a list of structures of preservation interest along the Trent & Mersey and Caldon Canal routes. On arrival at Middleport, the Convention Chairperson, Janet Smallwood, Cllr. Brereton, and Jon Honeysett, were interviewed by BBC Radio Stoke’s John Akers, before a Meeting commenced in the Pottery’s 1st Floor Functions Room. 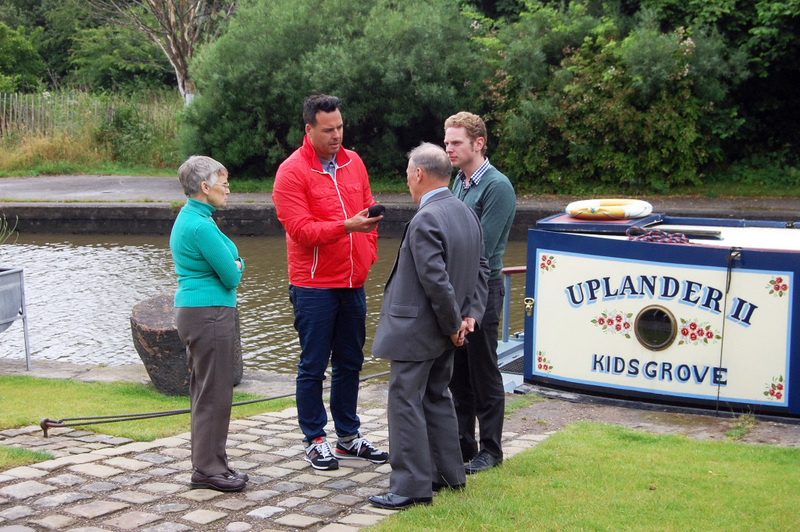 Also present were Newcastle-under-Lyme Borough Council Regeneration Officer, Trudi Barnard who is promoting Kidsgrove waterfront’s modernisation with Elliot Ashton, and Dr. Bernard Lovett, Business Advisor to the Etruria Industrial Museum. The Meeting concluded with agreement to form a Canal Project Coordinating Committee, with the above two personnel joining Cllr. Brereton and Jon Honeysett, to progress canal upgrading issues in early September 2015. Sarah Honeysett provided the photograph of the BBC Radio Stoke interview alongside Nb. UPLANDER II from Kidsgrove.